At the time of writing burning has not commenced in Tarset, but it will and most probably has by the time this post is published. The forecast for the coming week is a dry one. With ground drying rapidly over the past week there will be many considering trying a burn. A moor burn. There are many factors to bear in mind. Dry weather being one of them, but not too dry. Wind - the strength of and direction of, is another important factor to consider. 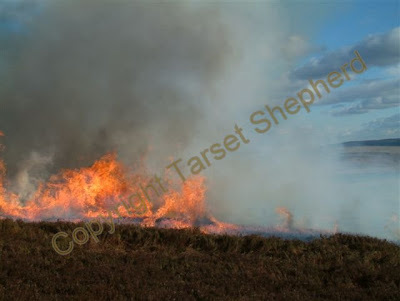 The moor burning season runs from mid October through to mid April, there are specific dates which off the top of my head I would say were the 16th but then I am probably wrong so don't quote me on that. 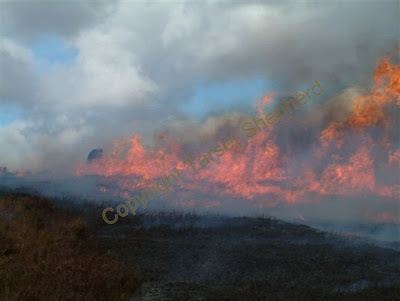 The idea of burning being between October and April is so as not to wreak havoc with the nests and young of ground nesting birds such as Curlew, peewit, skylark and many others. The dates also prevent burning in what could be classed as the driest months of the year, or ought I say the summer months are expected to be the driest months. There is a fair amount of heather in this area as well as course hill grass, all which benefits from being burnt. Both species regenerate, allowing fresh shoots to be enjoyed by livestock. Coarse and woody heather is of little use to many although it does offer cover for grouse as well as other wildlife. Of course, when you burn you don't wish to burn everything in sight, that would be to the detriment of both the stock and the wildlife. Controlled burning is what is aimed for. Very important in Tarset that the burning is controlled as which ever direction you look we seem to be surrounded by forestry trees and no one would wish to see them go up in flames. 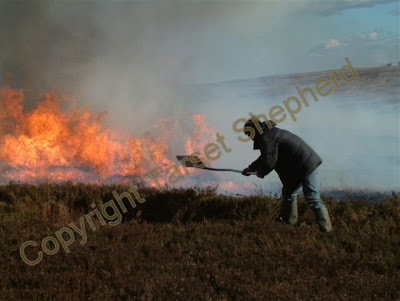 It is now necessary to inform the fire brigade (and the forestry commission if you are near the forest edge) that you intend to burn, this puts them on alert ought anything go wrong and also prevents them from scrambling when 'phone calls from motorists alert them of "moors alight". The fire brigade will not rush to douse the fire unless you call them back and request assistance. When you are content that the fires are out and you are finished for the day you notify the fire brigade that all is well, job done. Then should they get a call from a passing motorist they may well act upon it. I was talking to a farmer tonight who informed me that the fire brigade wish to come and practice on his hill - what a lucky fella! Apparently they have an argo cat and misting device for putting out hill fires. I'm intrigued and would love to find the time to go along when they're busy, mebbes I'll be able to find time. I have had to hunt in the archives for these photos, the above was taken in March 2010, the snow lying would act as a natural break, something to halt or slow down the face of the fire. The face of a fire is a horrendously hot place, the only way to control the fire is to beat the sides down (put them out) and head towards the face, beating it down from the outside edges as you go. Natural breaks are used such as rivers, wide streams, very wet mossy areas. Many now use toppers behind 4wd tractors or smaller brush cutters behind quad bikes to cut the growth of grasses and heather and hopefully make a break in that manner, it has to be cut fairly fresh however or the fire may well find dry matter to run across and continue it's inferno on the other side. A frightening place to be if you think the fire is getting out of control. Burning heather can see flames higher than yourself, if the wind picks up in strength or changes direction it can cause a great deal of trouble. The heat is unbelievable. It pays not to wear modern day fleecy clothing as that easily melts from sparks hitting it, sparks which can be blown in the wind and start another fire yards from where you are. Many of us who have been involved with moor burning will recognise the smell of burning hair, it is not unusual to lose the hairs off the backs of your hands, although there are now very good gloves and face masks available to use which take a lot of the discomfort away from the job. The conditions are becoming nigh on perfect for moor burning at the moment, the deciding factor will be the wind, how strong it is and from what direction it is coming for some. We will wait and see how much smoke rises this coming week.